Miss Universe 2013 Gabriela Isler from Venezuela presents the Yamamay Million Dollar Swimsuit for Miss Universe after the 2013 Miss Universe pageant in Moscow. Miss Universe 2013 Gabriela Isler, from Venezuela, presents the Yamamay Million Dollar Swimsuit for Miss Universe after the 2013 Miss Universe pageant in Moscow. 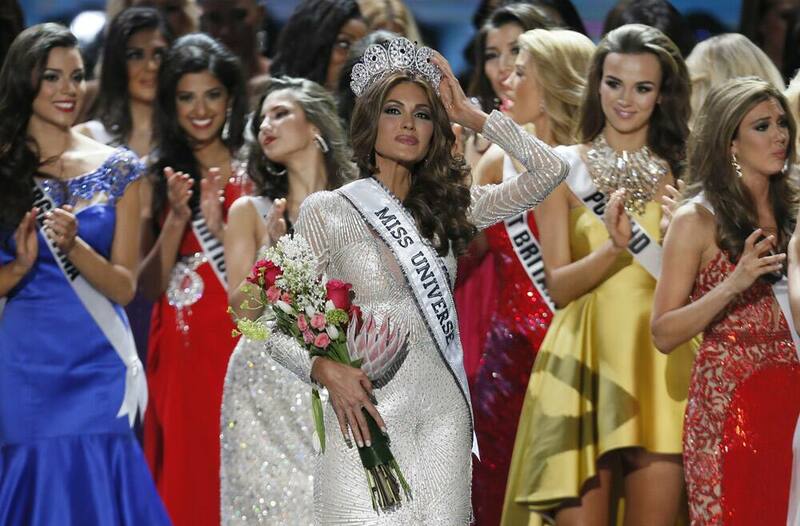 Miss Universe 2013 Gabriela Isler, from Venezuela, adjusts her crown after winning the 2013 Miss Universe pageant in Moscow. Miss Universe 2013 Gabriela Isler from Venezuela poses with her crown after winning the 2013 Miss Universe pageant in Moscow. Miss India Manasi Moghe participates in the final of the 2013 Miss Universe pageant in Moscow. Miss Switzerland Dominique Rinerknecht participates in the final of the 2013 Miss Universe pageant in Moscow. Miss Brazil Jakelyne Oliveira, left, receives a bouquet of flowers before leaving the 2013 Miss Universe pageant in Moscow, Russia. Miss USA Erin Brady smiles while partcipating in the 2013 Miss Universe pageant in Moscow. Miss Great Britain Amy Willerton smiles while competing in the 2013 Miss Universe pageant in Moscow. Miss Philippines Ariella Arida participates in the 2013 Miss Universe pageant in Moscow. Miss Spain Patricia Yurena Rodriguez participates in the 2013 Miss Universe pageant in Moscow. Miss Brazil Jakelyne Oliveira participates in the 2013 Miss Universe pageant in Moscow. Miss USA 2012 and Miss Universe 2012 Olivia Culpo taken a group picture with participants of Miss Universe 2013 during the preliminary competition of the 2013 Miss Universe pageant in Moscow. Miss Switzerland Dominique Rinerknecht presents her outfit, during the national costume show at the 2013 Miss Universe pageant in Moscow.